Donald Trump welcomed all of the sitting justices on the Supreme Court to the White House Rose Garden for the swearing in of Neil Gorsuch to be his first Supreme Court justice. After he took the oath, Gorsuch thanked colleagues and family and said he was honored “to have my mentor here,” in reference to Kennedy, who, he noted, was swearing him in, “as he did for me 11 years ago when I became a circuit judge.” Gorsuch clerked for Kennedy in 1993. Gorsuch’s confirmation marks the first time a Supreme Court justice and his former clerk will be serving on the high court at the same time. And eighty-year-old Kennedy is expected by some to be the next justice to retire. There was a little more symbolism in the ceremony, too. 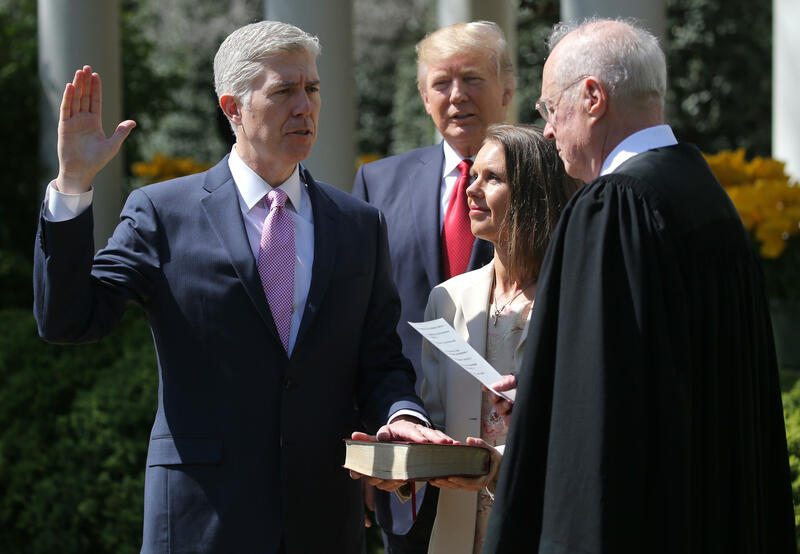 This was first time a Supreme Court justice has been sworn in at the White House since Gorsuch’s predecessor, the late Justice Antonin Scalia took the oath in 1986, CBS News’ Major Garrett pointed out. “Go get ‘em. Go get ‘em,” Mr. Trump told the newest justice on the court, as he shook Gorsuch’s hand after the oath was administered. CBS News Chief Legal Correspondent Jan Crawford says that now that he’s been confirmed, Gorsuch will start work immediately. He’ll sit in on the justices’ conference on Thursday and weigh in on upcoming cases to add to the docket. He’ll begin hearing arguments -- the court is in session until June -- and he’ll cast votes in those cases. The court could decide to reschedule arguments for cases that are deadlocked 4-4. This nomination is a president’s most lasting legacy so far, Crawford added. Mr. Trump has appointed a justice on who’s 49 years old, conservative, and will sit on the court for a generation to come. President Trump could also well get another nomination -- or even two. This appointee will not change the balance of the court, however. It will keep its 5-4 narrow conservative majority for now. Gorsuch’s confirmation came after a bruising fight that saw Republicans change the rules for approving Supreme Court picks - over the fierce objection of Democrats. Earllier Monday, Chief Justice John Roberts administered the Constitutional oath to Gorsuch in a private ceremony in the high court’s Justices’ Conference Room. He replaces Scalia, part of the court’s conservative wing for nearly three decades before he died unexpectedly in February 2016. In nominating Gorsuch, Mr. Trump has said he fulfilled a campaign pledge to pick someone in the mold of Scalia. During 11 years on the federal appeals court in Denver, Gorsuch mirrored Scalia’s originalist approach to the law, interpreting the Constitution according to the meaning understood by those who drafted it. Like Scalia, he is a gifted writer with a flair for turning legal jargon into plain language people can understand. His 66-day confirmation process was swift, but bitterly divisive. It saw Senate Republicans trigger the “nuclear option” to eliminate the 60-vote filibuster threshold for all future high court nominees. The change allowed the Senate to hold a final vote with a simple majority. The White House swearing-in ceremony is a departure from recent history. Justices Sonia Sotomayor and Elena Kagan were both sworn in publicly at the Supreme Court. Former Justice John Paul Stevens has argued that holding the public ceremony at the court helps drive home the justice’s independence from the White House. He is the youngest nominee since Clarence Thomas, who was 43 when confirmed in 1991. The Colorado native went to high school in Washington while his mother served as EPA administrator in the Reagan administration. He’s the sixth member of the court who attended Harvard Law School; the other three got their law degrees from Yale. Gorsuch credits a nun with teaching him how to write. He and his family attend an Episcopal church in Boulder, though he was raised Catholic and attended Catholic schools as a child. He joins a court that has five Catholics and three Jews. As an associate justice, Gorsuch will earn $251,800 a year - more than 15 percent higher than his $217,600 salary as an appellate judge. Gorsuch joins the ranks of justices who are millionaires. He reported financial assets in 2015 worth at least $3.2 million, according to his latest financial disclosure report.